IN A GLANCE: A very warm story filled with love and courage! Through stunning imagery, an intricate and adventurous plot, and a strong cast of characters, Feather Stone gives readers a fast paced story woven with murder and magic. I was so excited when I got this book for the tour. I had been wanting to read it for a while and dove right in when it came in the mail. When I say dove right in, I mean that literally, this book draws you in and doesn't let go till you've read the very last word. The characters are amazing and well developed and the plot, wow lets just say it is jam packed full of emotion. One minute I was laughing, one minute I was so mad, then I'd be crying my eyes out reading it. I love it when an author can elicit that much emotion out of me when I'm reading. It shows they did their jobs correct and connected me to their story and their characters. Feather Stone did just that in The Guardian's Wildchild. 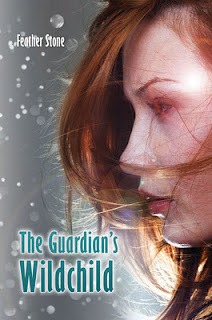 All in all The Guardian's Wildchild is a great book and I would recommend it to anyone that likes Paranormal romance!